Design Maze: One Room Challenge Fall 2017 ~ Week 7 The Reveal! One Room Challenge Fall 2017 ~ Week 7 The Reveal! Welcome to Week 7 of One Room Challenge Fall 2017 and we are ready for the big reveal!! It has been such a fun, inspiring, and nerve racking (at times) process to makeover a couple of spaces in seven short weeks. From staying organized with trades' schedules to making sure all the items we love would arrive on time, it surely was a roller coaster ride of emotions and a trip or two south of the border to pick up some super express shipments. 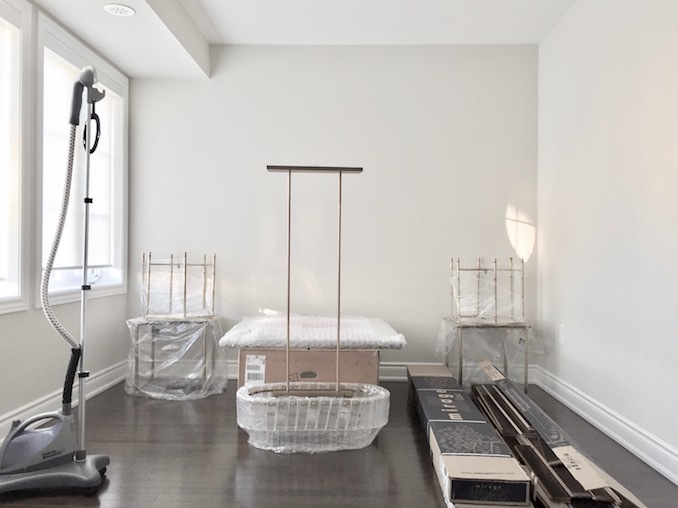 It is hard to believe this was my client's guest bedroom a few short weeks ago: a blank slate ready to be re-imagined. 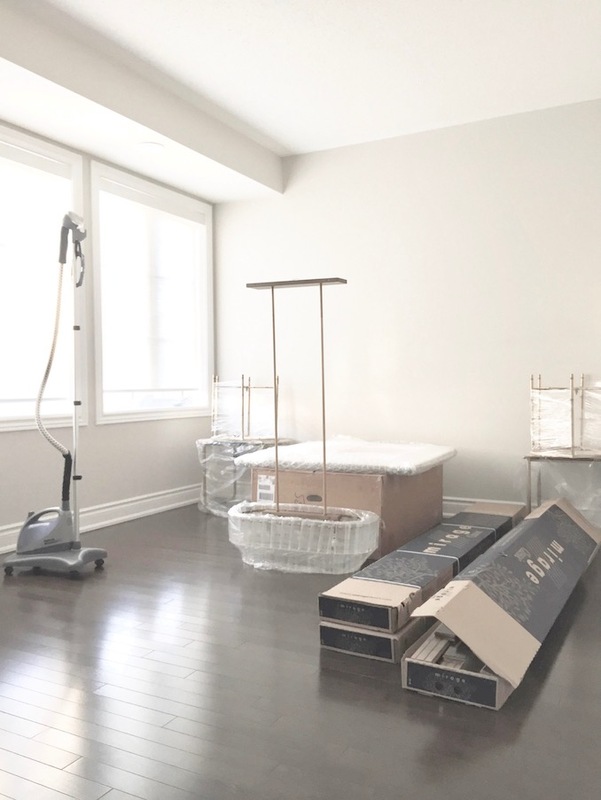 Here is the same view after countless hours of hard work, late night shopping / discussions, loads of creativity, love from my favourite brands including HomeSense, Brizo Faucet, Black Rooster Decor, West Elm, and of course Cole & Son for the most marvellous Nuvolette wallpaper. I want the guest bedroom to feel like your private retreat on a luxurious cruise sailing along the Mediterranean Sea. 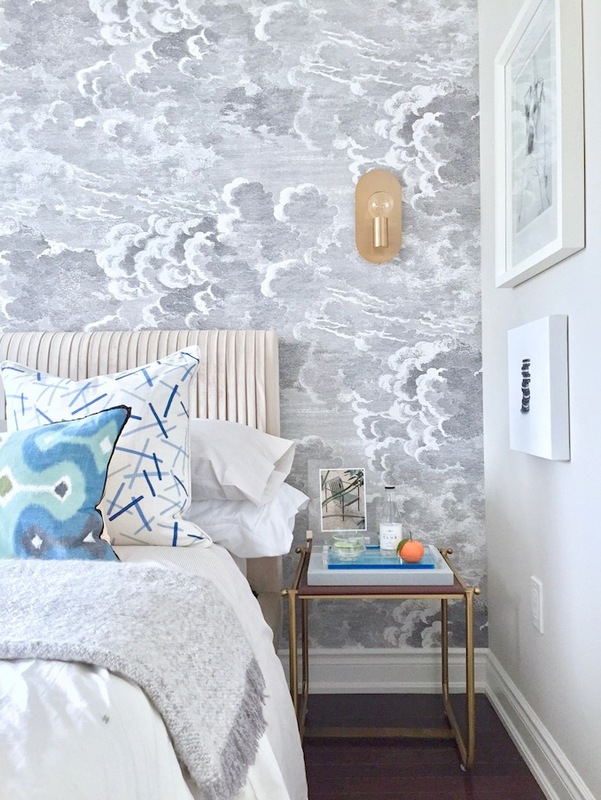 The cloud wallpaper gives us an instant sky appeal, while the pair of wall sconces and side tables reminds me of the interior finishes of a sailboat attributing to a sophisticated, nautical vibe. I love fabrics! 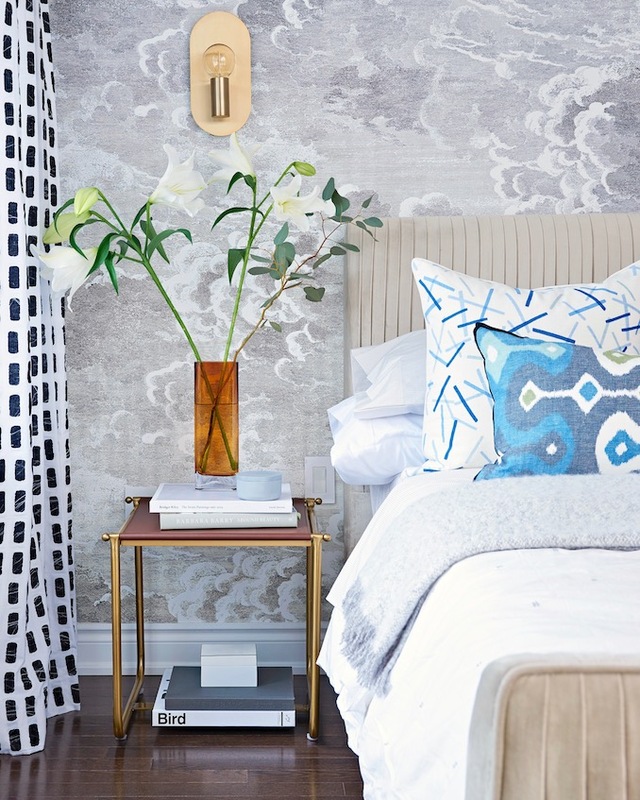 There are endless possibilities with patterns and textures and in this guest bedroom, we have sprinkled 11 different fabrics among the incredible upholstered velvet bed, the duvet and sheets set, the playful yet decadent pillows, and the graphic drapery just to name a few. 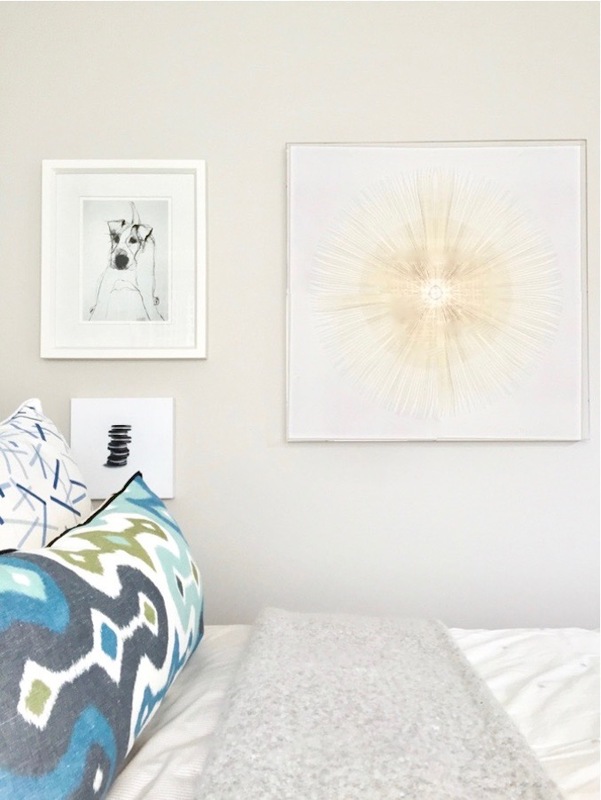 To balance the dynamite patterns and pops of vibrant colors in the room, I went monochromatic and outfitted the wall next to the bed with a trio of visually light yet big impact art collection. The large scale paper art framed in lucite shadow box creates such presence in its pure form and shade. 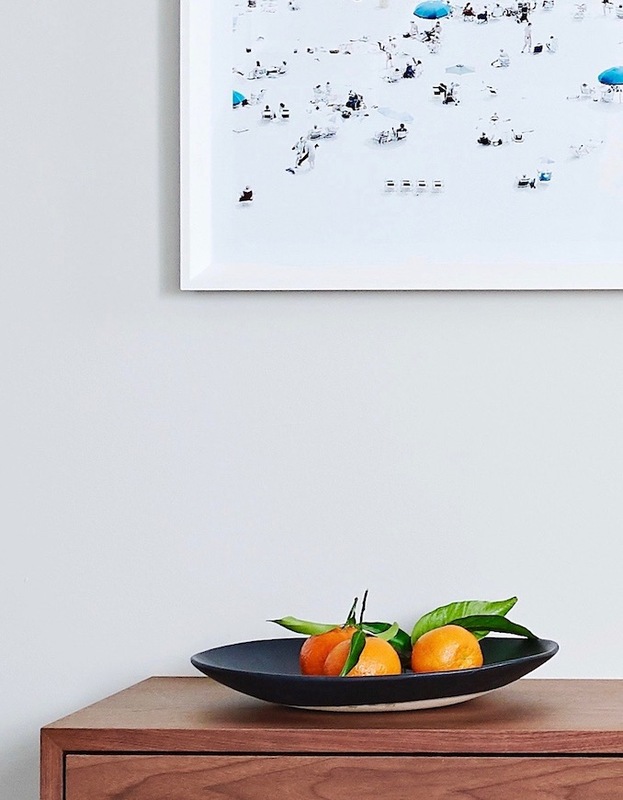 The dog print is one of my all-time favourites and I simply couldn't be happier to include a stack of Oreos from the talented Erin Rothstein. 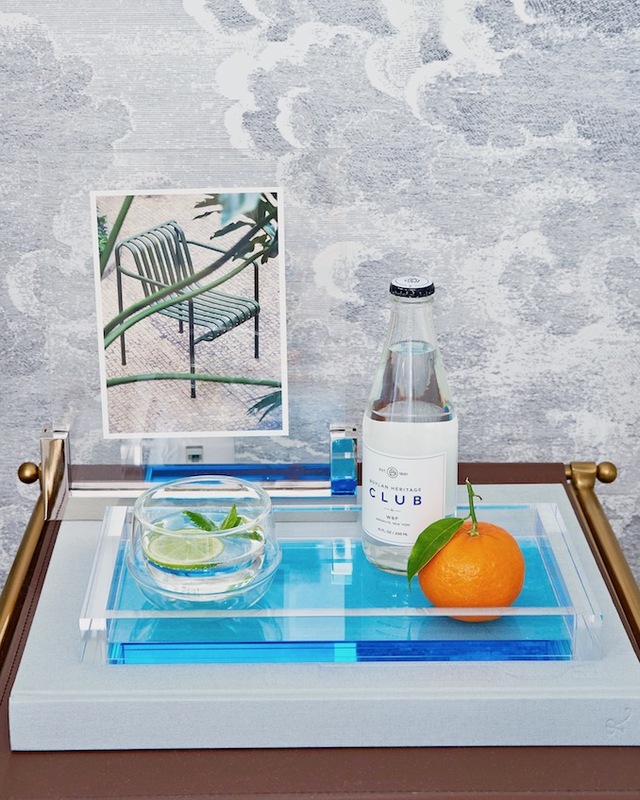 From sculptural blooms to pop of bright mandarin, this side table provides our guests the perfect spot for a glass of water and a light snack during their stays. In terms of accessories, don't always focus on what the intended function / location when you are out shopping. This sleek clear + ocean blue lucite tray is actually from the bathroom department but hey, I think it looks phenomenal right here! The little card I picked up when in Munich this summer also looks floating "in the sky", literally. 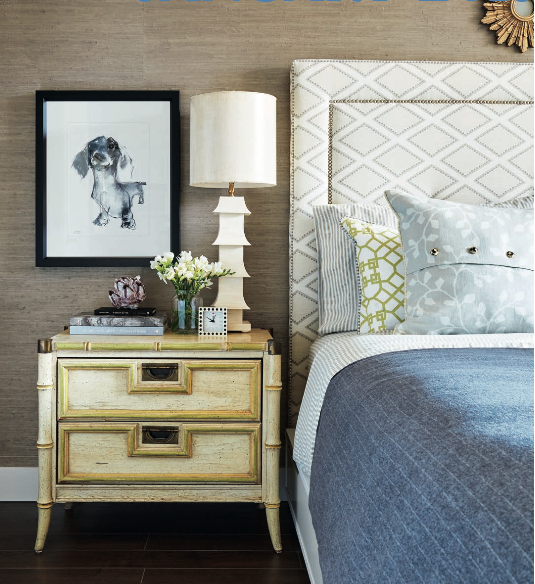 Ready for a chic and serene corner on the other side of the guest bedroom? Believe it or not, this round window was actually my inspiration for the ocean travel feel I am after in this space. 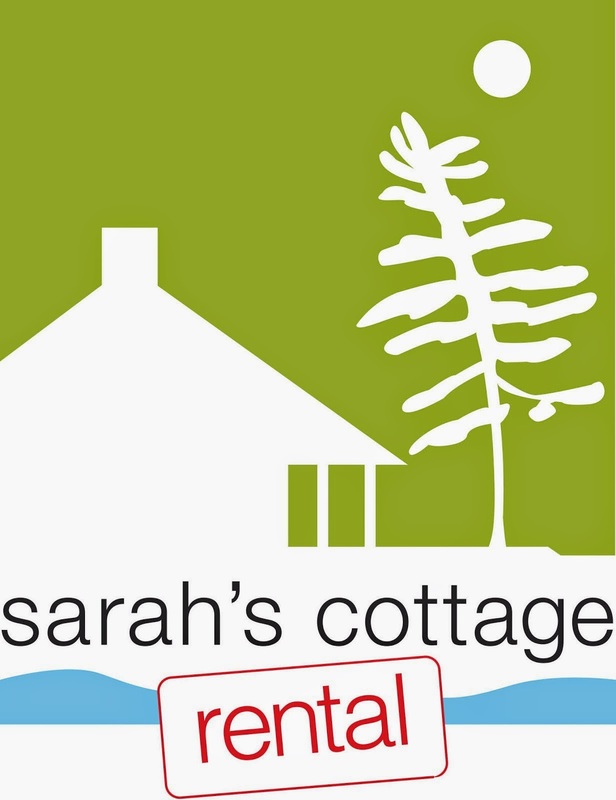 I want the guests to feel right at home and for me, that includes a quiet spot to enjoy my favourite book with a cup of tea, or to write a post card or two while on vacation. That's exactly what I have achieved at this corner. The contemporary OK pendant light is perfectly duo purposed (it is height adjusted and could turn the light left or right as required), while the floating desk offers high style with practical storage. The natural walnut side table echoes the leather on the bedside tables and I love how the bleached wood on the chair complements the velvet pleated bed and matches the framed agate seamlessly for one harmonious room. One last before and after shot of the guest bedroom. I LOVE this transformation! Now it's time to check out the Powder Room. Once a basic box with a toilet and a pedestal sink and no visual interest, our new and improved powder room now gives a lasting first impression thanks to the daring photography, ravishing side table with an attitude, and of course our sensational wallpaper makes an encore appearance in full effect as we covered the entire room with clouds including the ceiling. My design theosophy for powder room is that since it is a small space and generally only used by guests, you should go bold and decorate it with absolutely everything you love without hesitation. 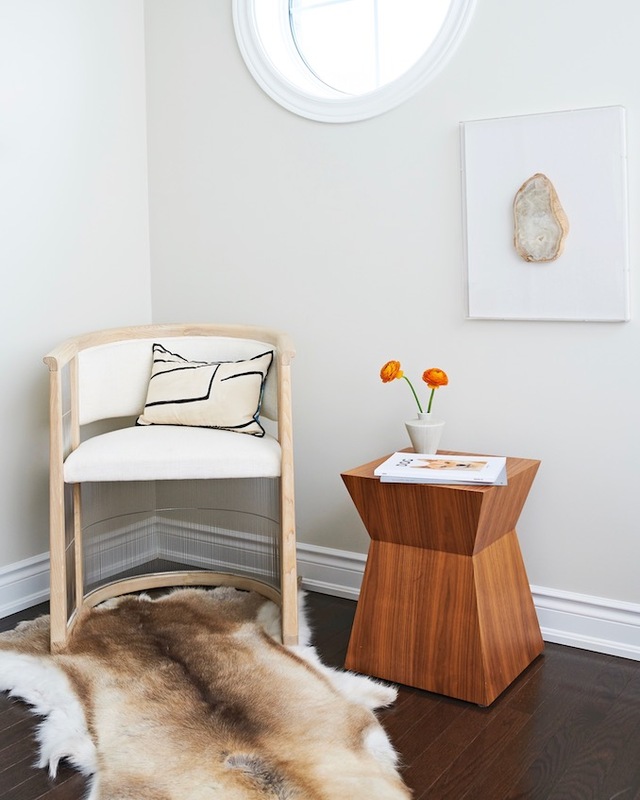 Treat it as an opportunity to step outside of your comfort zone and let this small spot be the jewel box of your home. 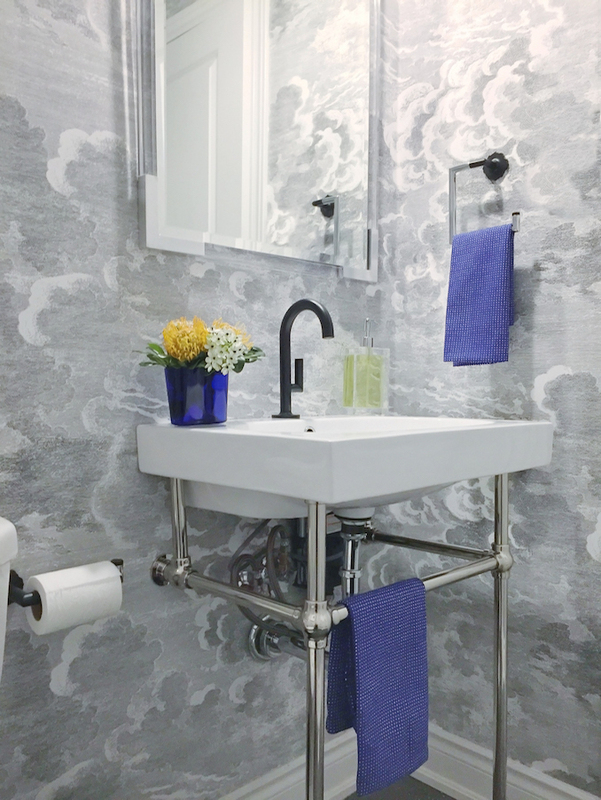 That's exactly what we did in this powder room for one dramatic before and after transformation. 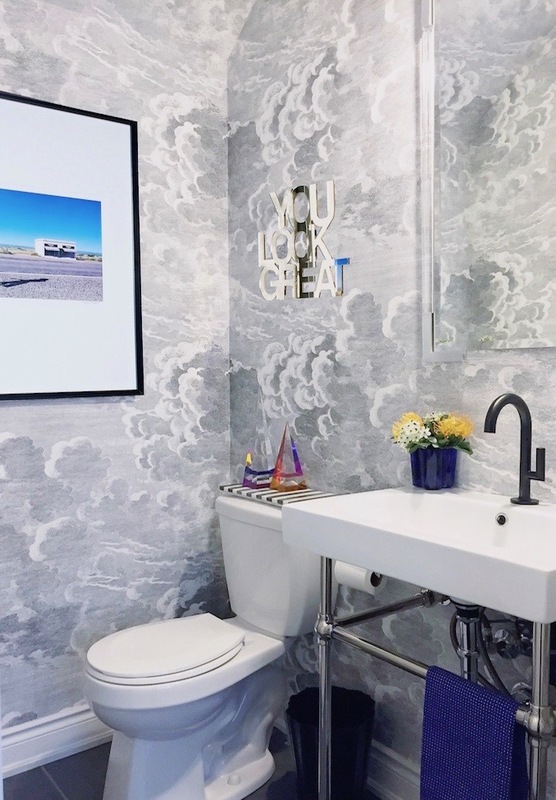 From the timeless classic open base vanity, daring photography and wall art, lucite mirror and accessories for sparkles and extra shots of colors, iconic pressed glass pendant, and of course the incredibly chic matte black Jason Wu's faucet and bathroom accessories for Brizo. I have been dying to use this luxurious and elegant faucet for the longest time, so you can imagine my excitement when this stunning fixture was installed and it is beyond my wildest dreams. 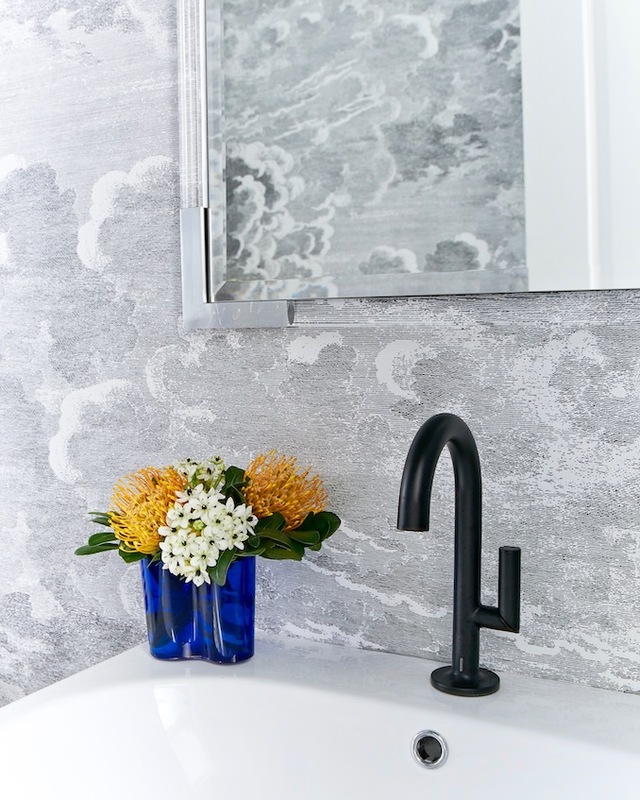 If you are looking for a modern bathroom collection to give your own bathroom an instant transformation, be sure to check out the Jason Wu faucet and accessories collection. 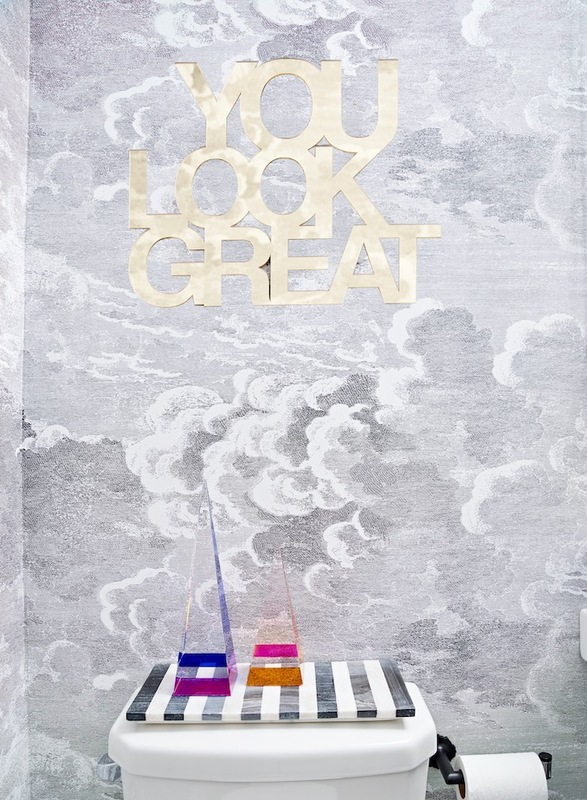 And who wouldn't want to be reminded "You Look Great" especially when you are at a party! 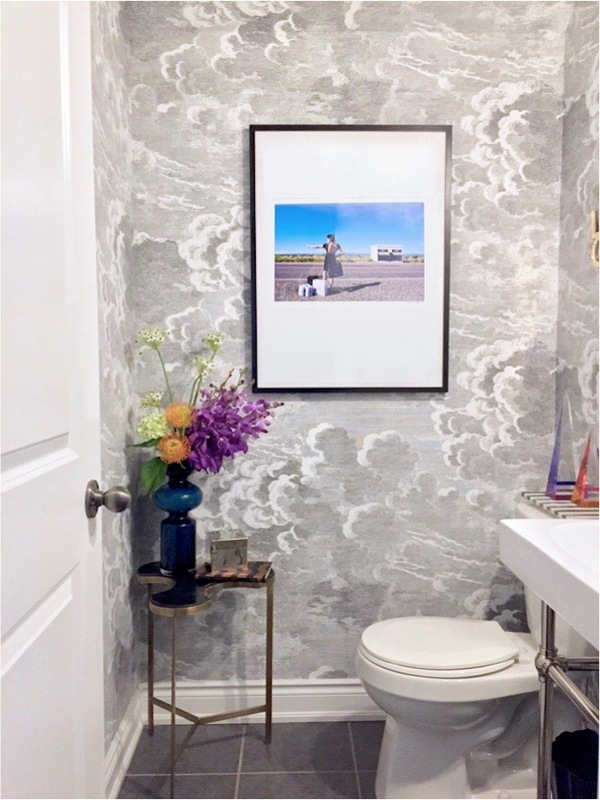 I am so thrilled with this fabulous piece by Toronto artist Jade Rude and hey, this may just put my powder room as the "most selfie-taken powder room" in history! Thanks so much again for all your kind words and supports over the past seven weeks. We couldn't have completed these two amazing spaces without your encouragement and love. Will, your photos are spectacular and you have made my creations come to life through your lens. Now it's time to check out the 20 featured designers and my fellow guest participants for their inspiring transformations. 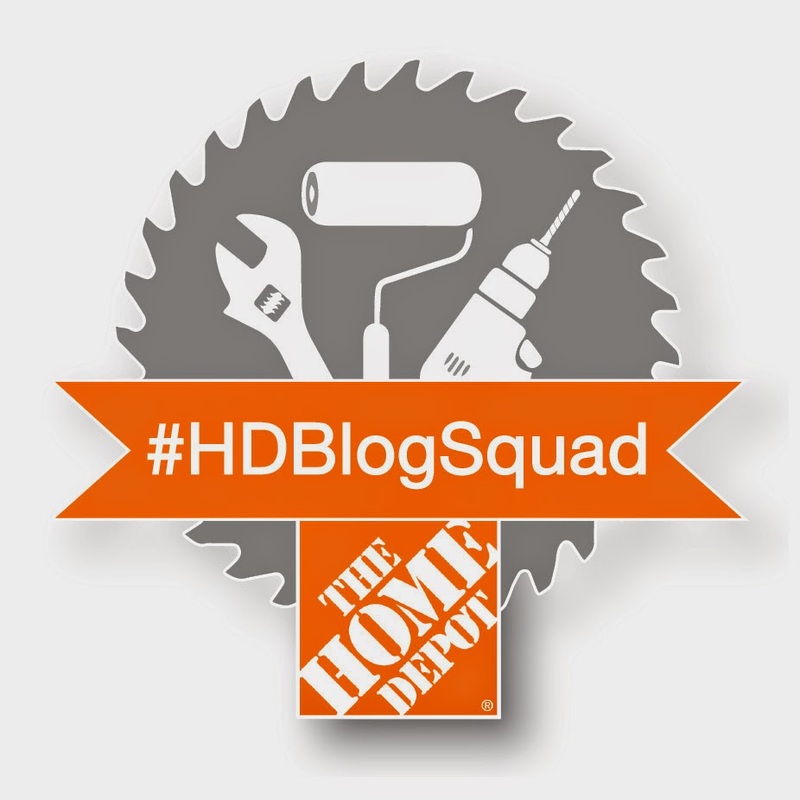 Thank you so much Linda of Calling It Home and House Beautiful to host yet another successful One Room Challenge! Can't wait until Spring 2018 to see everyone again! thanks Michelle! I wish this is my home! Wow, what an intriguing and FUN room. There is so much to look at and love. This was a really fun one to watch and it's so rewarding to see the final results! Great job Tim!! awww Laura TYTY! We surely did have a lot of fun pulling the rooms together and loving the results! Now we have catch a break before the holiday season begins! What a FUN and artistic space! I especially love the small "puzzle" table in the bath. Of all of the rooms, I have been anticipating this one. You did not disappoint. Nice job! Thanks so much for stopping by and yes, that table is definitely one of my favorite items too! congrats to your #ORCFall2017 makeover too! What an awesome job done on these two rooms! There are so many thoughtful details combined to make an amazing space. Beautiful job Tim! Thanks so much Kim for your kind words. We did spend a lot of energy and creativity to make these two rooms live to their full potential. I am so thrilled you think so too! So So Good! 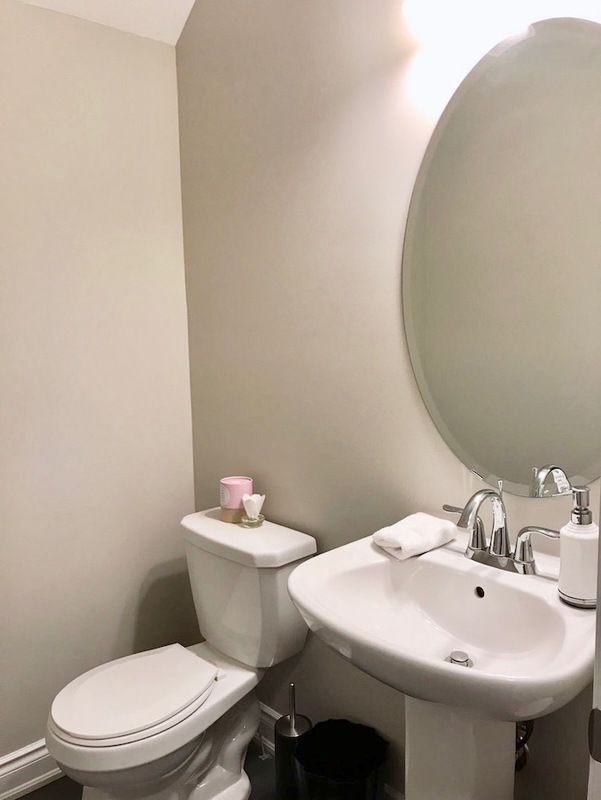 turned out great, and I loved the feeling you portrayed in your rooms, especially love the pops of color in the bathroom with the other sleek finishes! xoxo Suzanne! that feeling was really my inspiration and I am glad that it came through my design. Thanks for stopping by! You did a fabulous makeover, Tim! Kudos to you! xoxo J!! You will have to come see it in person! Oh la la! It's so pretty! I love the wallpaper (swoon!) and the velvet bench and oh my that light is perfection. Well done! thanks Cathy!! that wallpaper is truly a showstopper! So So much to lust over in this room! I cannot get enough of that wallpaper! It's to die for! Congrats on your awe-inspiring makeover! awww you are so sweet Natalie! your office looks fantastic too! This is so fresh! I love the pop of colours against that wallpaper. You did an amazing job! Thanks Sabrina!! 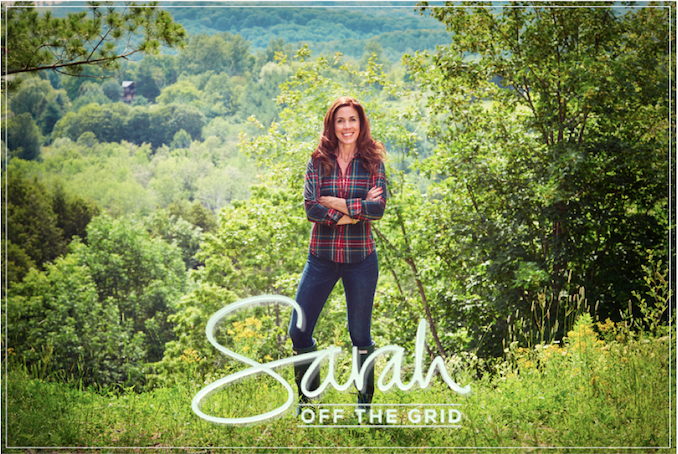 hope to catch up with you at an event soon! Those are my favourites in the powder room too! Totally made the space don't you think? So much creativity here Tim! 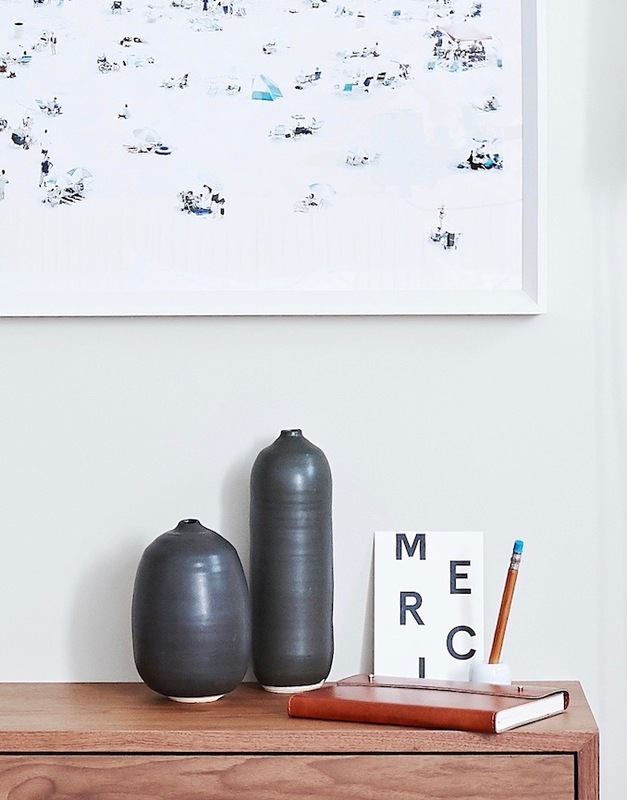 I love the floating modern desk and artwork above it. TYTY Lisa! hope you are inspired too! Beautiful rooms, Tim!! You are so creative with your colours and accessories. I absolutely love the pops of orange in there. It’s the perfect guest bedroom and bath! Well done! Thanks for being so encouraging with your comments. Tim. I almost have no words. This room is amazing. The color, the pattern, the wallpaper...everything is gorgeous! You did such an outstanding job. I'd be surprised if they didn't pick you to be a featured designer next year. You're truly talented! Love this room. Oh you are too sweet! I love your foyer too and that staircase is just so much fun! High five to wrapping up #ORCFall2017 in style! 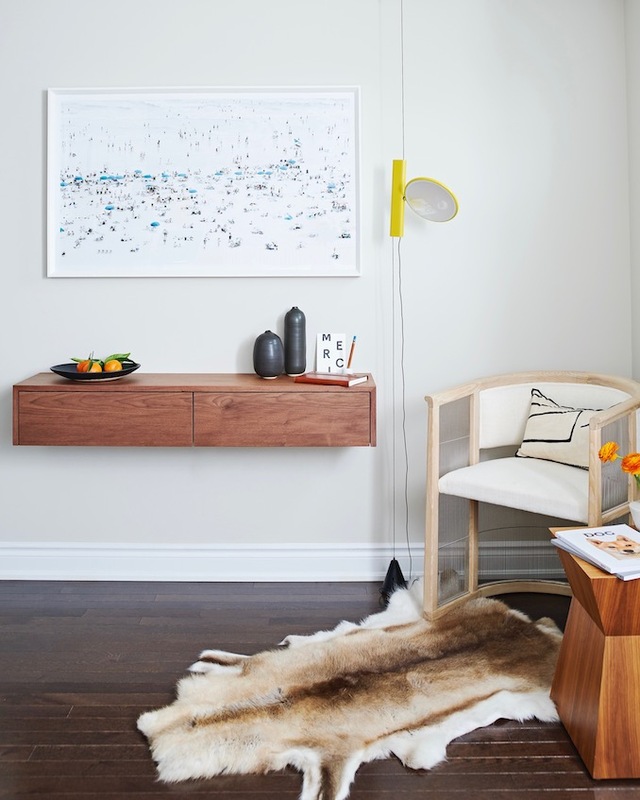 This is such a beautiful space and I love the attention to detail that you put into the accessories and artwork! It tells a story! 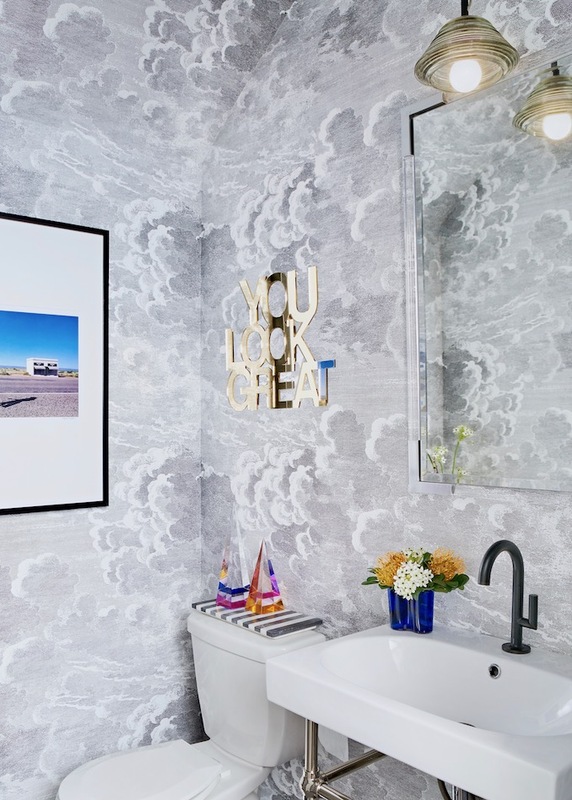 I especially love the postcard floating in the sky, so cool, and the Jason Wu faucet. I used this in a recent client powder room as well and it's just so stately! Beautiful work! I love that postcard too Nikki!! 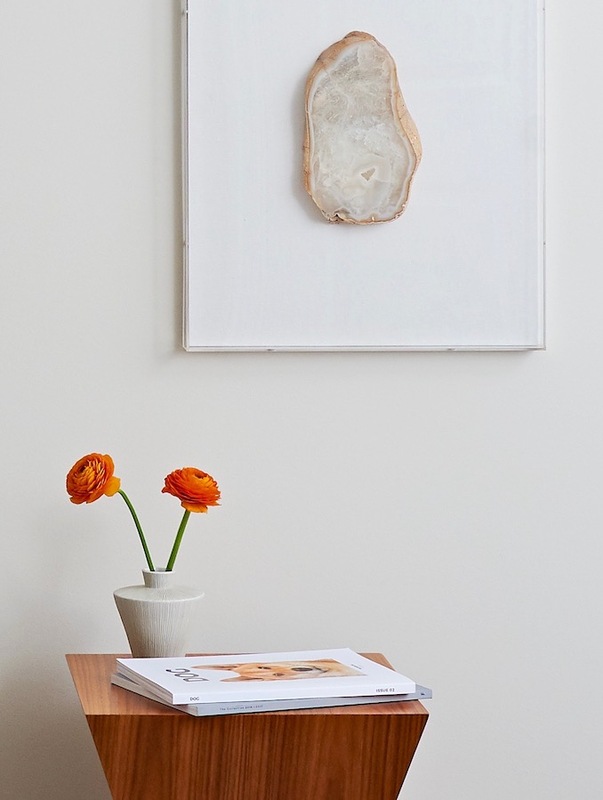 So glad I have found the perfect frame for it to "float" in front of the wallpaper. There was a lot of consideration on the details but so worth the effort! Tim, this is simply beautiful! I love your use of artwork especially the one in the bathroom. My 5 year old blurted out while looking with me, "That's a good rug!" referring to the blue one. Then as I scrolled further, he shouted, "Look at that rug! It looks like a fox! - now the deer rug...lol. So you know your rugs are a hit :). Great job! that's so cute Delia and you boy is a designer in the making! love that he has an aesthetic opinion . .. think he learned that from his mom! congrats to you on wrapping up your #ORCFall2017 as well. Looking forward to the spring challenge! Tim, I need to take a page from your book of design. Everything breathes so well here, and all the colours are in perfect harmony. I love every bit of this, and most definitely pinned half of it ;) Looking forward to your next room! Simply stunning! Your talent always blows me away. I would never think to mix those fabrics and patterns! Sheer genius! Thanks Barb!! that's exactly what I love to do the most ... mixing patterns! visit us again soon! Love how this turned out, Tim! Your mix of color is always so wonderful! Thanks so much Gwen!! your complement meant a lot to me especially when your #ORCFall2017 is just beyond!! You have made my day! Love, love these rooms! 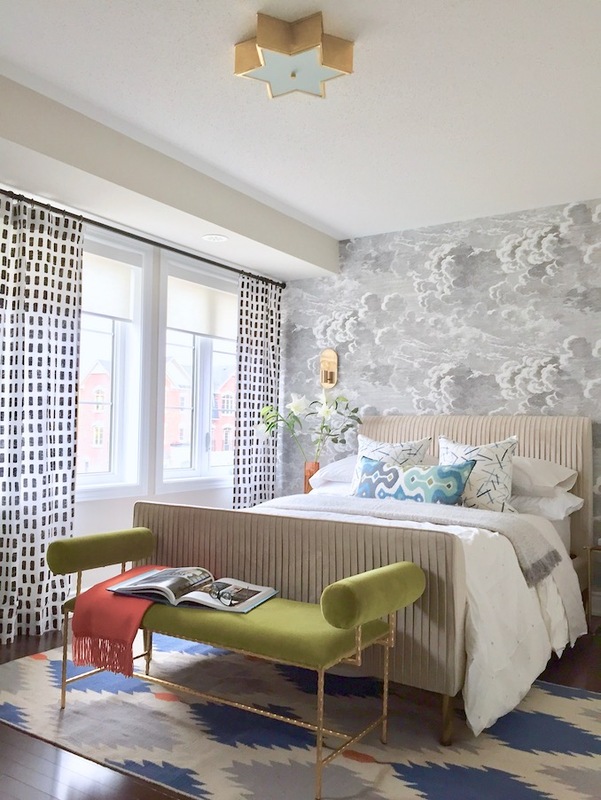 Such an inspiring use of pattern, color, art, and finishes! Beautiful. I just LOVE the color of the bench at the end of the room, and how your repeated it in little ways throughout...even down to the color of the handsoap! How pretty and relaxing this space is! Both rooms gorgeous but I love that the wallpaper cocoons the entire bathroom! Did not see a source for the floating drawers? thanks Diane! 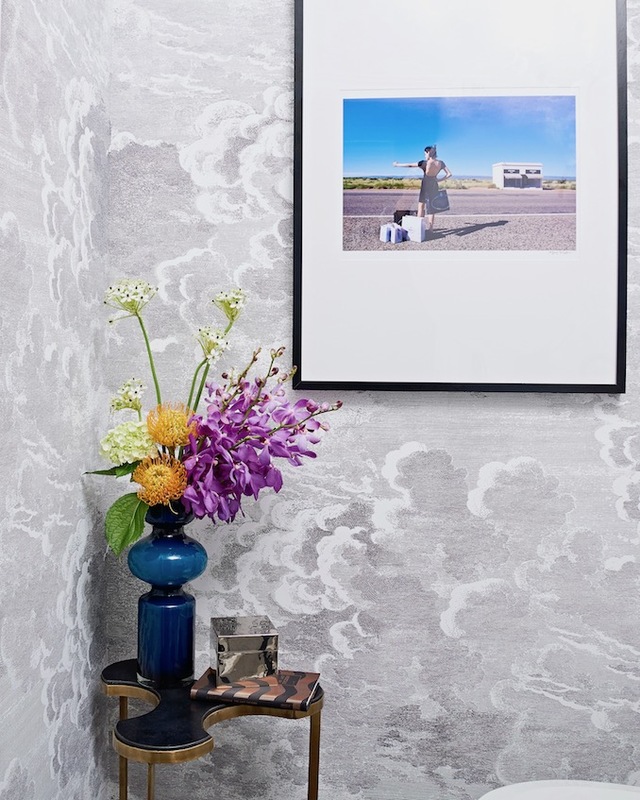 That was our jumping off point in the powder room, to find a fab wallpaper that we can wrap around the entire space without feeling enclosed. So happy you like the floating unit in the bedroom. it's actually a custom piece designed by me. The color combo is stunning! I love the bench. And those suspended (?) lights, what a cool unique touch. Thanks Deb! Love that light too and it's just as functional as it looks too! Thanks for dropping by! If there is a room on a luxury cruise ship that looks anything close to this sign me up!! The combo of the rug, wallpaper, and bench still strikes me as so fresh and inspiring - just love it all. Also - I have to say that I've seen so many thoughtful and supportive comments from you on so many blogs every single week of this whole process - it really shows what a great person you are in addition to a great designer. Just wanted to say thank you for taking the time to reach out and help spread such a positive attitude with all of us! Me too!! Think I need to work with one and get a trip around the world in return! awwww you are so sweet Jenny! TYTYTY! Oh Tim, your rooms just make my heart go pitter-patter! Just love it so! I knew it the moment I saw all the gorgeous details going into it and I was not disappointed! I know for sure you'll be one of the featured designers next ORC! Can't wait what to see what you do then! Congrats and Cheers to us for another room done! Thanks Vel! 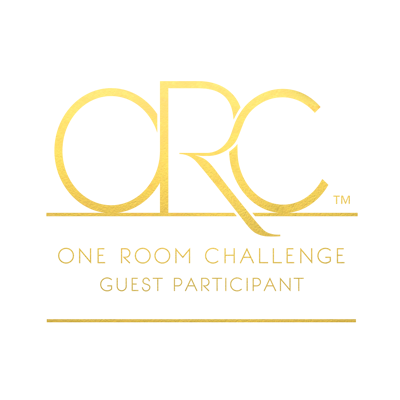 It has always been fun to participate in #OneRoomChallenge and love meeting all the friends in the community. Your bedroom looks great too with lots of thoughts put into the process. congrats on that fireplace redone ... looks so much better! Now you can kick back to enjoy your new fab retreat! gorgeous space! that velvet pleated bed is insanely beautiful. well done! Oh that bed ... it was IT when I saw it ... so beautiful! Yessss! I have been looking forward to seeing this room, Tim. It is as gorgeous as I expected it to be. I love the "You Look Great" sign in the bathroom. :) It has been a pleasure following along with your project. I have learned a lot from your posts. Thank you! I feel exactly the same about your breakfast room!! so charming and those windows ... I am so jealous! so much work on the floor but what a payoff! Now i want to come over for brunch! Thank you, Tim. This comment means a lot to me. 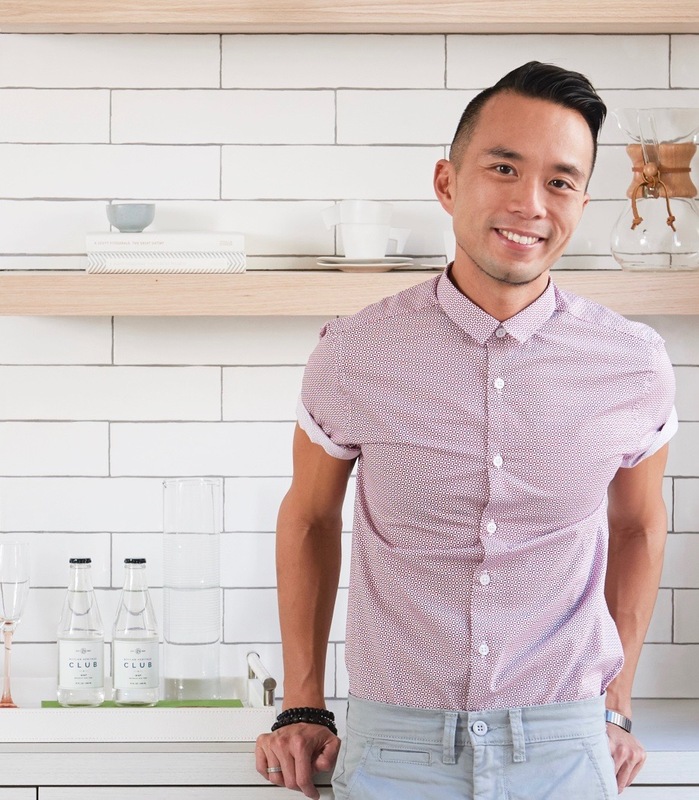 First of all, the entirety of the space and your design is incredibly chic yet fun! But then the details are what make it even more fabulous! 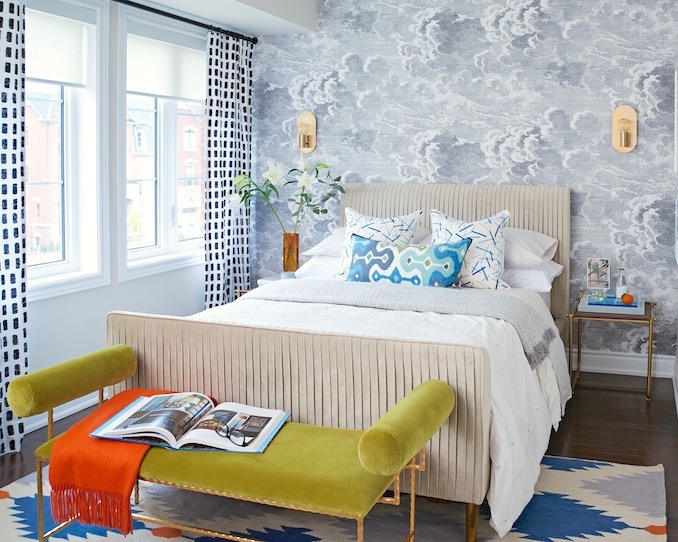 I have been eyeing that chartreuse bench for the longest and I'm so happy to see it used perfectly in this bedroom. The "floating light" may be one of the most creative and thoughtful designs I've seen in a while. 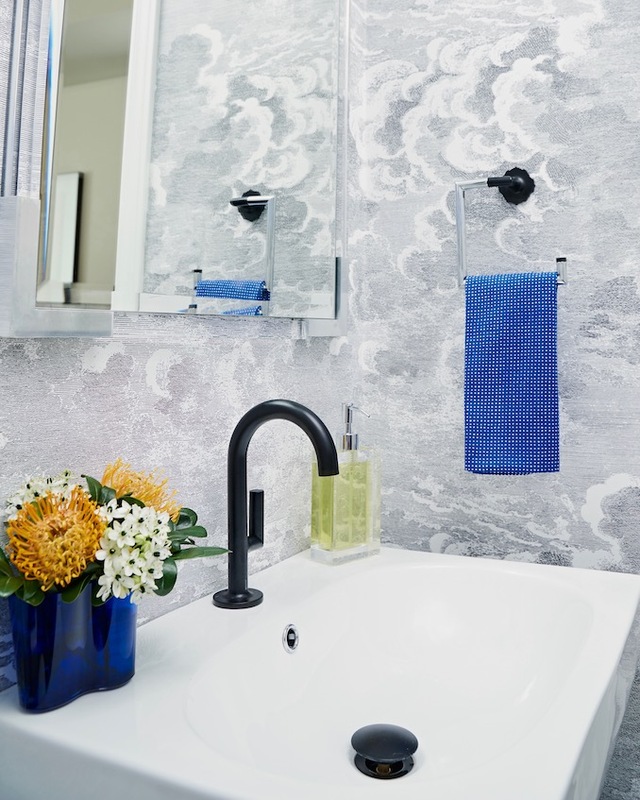 And the way that the wallpaper makes a second appearance in the bathroom is so smart in tying things together! Very Very nicely done my friend! Thanks so much Diane for your kind words. It's so rewarding to see people relating to the spaces and be inspired by the details and choices we made during this process. So glad that you love the wallpaper as well and I may just have to install that in my own home! You’ve got me swooning over here. I absolutely love what you’ve done! Color combinations and the balance of neutrals are perfect! Congratulations! Thanks so much! Come back next week to see my top #ORCFall017 picks! Thanks V! It was fun to put these spaces together and I am so jealous of my client right now. Loving yours too and looking forward to next round of One Room Challenge! Wow! This transformation is so amazing - and absolutely cozy! Congrats on a stunning reveal - honored to have been in this ORC with you! Thanks Jen! Just love how supportive the ORC community is and so glad to have met so many of you throughout the process! let's do it again in Spring! Your taste of style is amazing! I love the mix of colors and patterns in both of your rooms. So much thought and detail put into your process to make such an amazing transformation. Glad to have met you during the ORC! xoxo Julie! Mixing colors and patterns is my absolute favorite thing to do in the design process ... just can't help myself. So glad you like my choices! 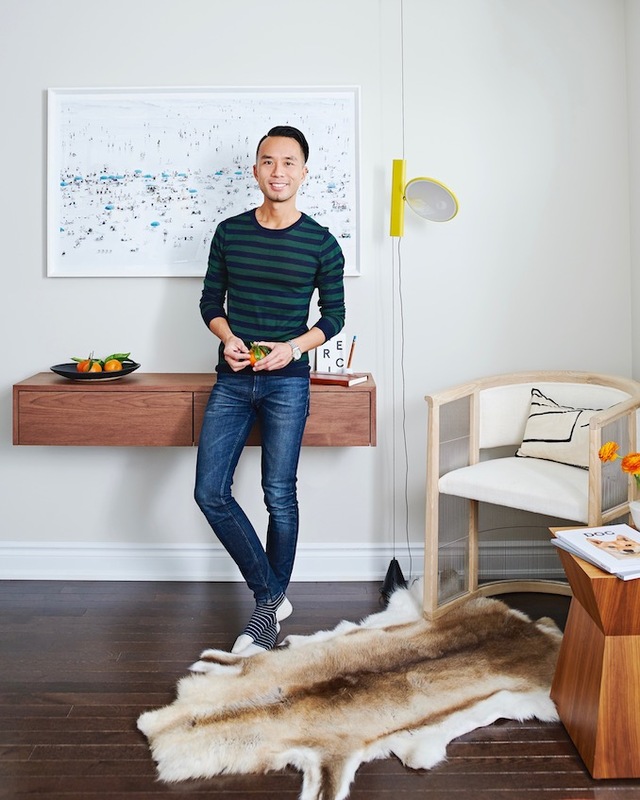 Love the transformation in both spaces - but I had to comment because I've been in love with the Jason Wu faucet line forever and instantly recognized it! Me too!! The entire bathroom collection is just so beautiful and I can't wait to use it in my own home! I don't know what I love most - the wallpaper or the furniture! So good. Thanks Rachel!! Funny I think I feel the same! so hard to pick just one item to like the most! I am in awe of how you've layered and perfectly combined so many colors and textures. It is a true art form to put a room together in this way, and I LOVE it. That rug is fabulous as well! What a fun space! I loved the mix of textures, patterns and colour - great work! Thanks Carley!! That's my favourite part of the design process! 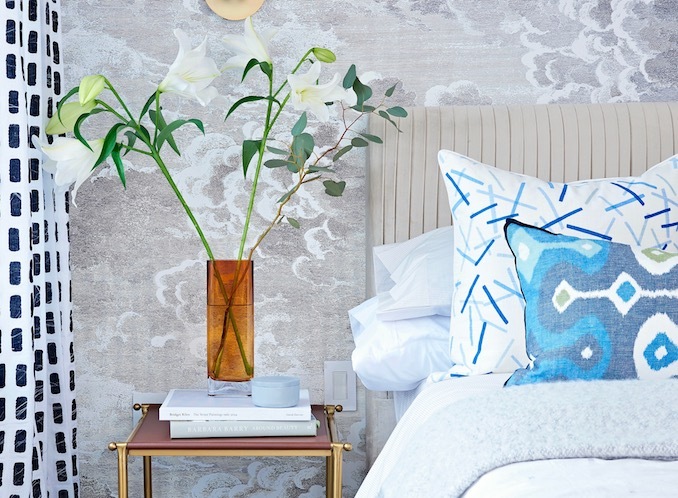 I love the combinations of patterns and textures - from the wistful clouds to the pleated bed to the selection of textiles - it all looks very luxe.